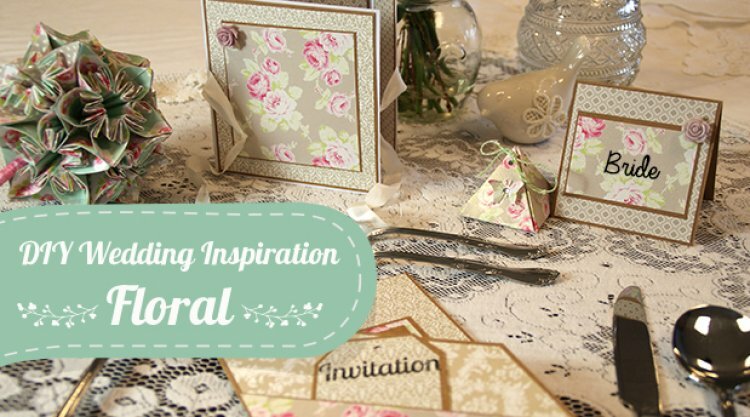 These beautiful florals make gorgeous wedding stationery and add a delicate vintage touch to your special day. 1. Take a 5x7 Kraft card and cut the corner off by measuring 11cm down the right hand side and then cutting up to the top left corner. Save this cut off for later. 2. Cover the front of the card with grey damask print card, cut a 12 x 17cm rectangle and measure 10.5cm down the right hand side and then cutting up to the top left corner. 3. Take the cut off piece of kraft card and stick to the bottom left corner to create a pocket, cover with rose print card. 4. Cover the inside of the card with grey patterned paper cut to 12.5 x 17.5cm. Then cut two pieces of kraft card one 9x9cm and one 7.5x7.5cm, cut a piece of rose printed card to 8.5x8.5cm and layer them all together and glue to the centre of the inside page. 5. For the tag cut a piece of kraft card 6.5 x 9cm , trim the top corners off to create a tag shape. Cut a piece of the grey print card to 6 x 8.5cm, trim the corners and layer on top of the tag base. Punch a hole in the centre. Top Wedding Tip: The tag can be used as a RSVP, why not get your guests to suggest songs for the reception disco! 1. For the name place use a Dovecraft 3 1/2 “ kraft card turned so the fold is at the top. Cover with a piece of grey printed card cut to 8.5x 8.5cm. 2. Cut a piece of kraft card to 7 x 5.5cm and layer with the rose print card cut to 6.5 x 5cm. Add a resin flower to the top right corner then just add your guests name. 1. For the favour box use our template to create the shape using the pearlescent rose card, punch a small butterfly out of the same card and stick to the front of the box, embellish with gems. Use a piece of twine through the holes to hold the box together. 1. Cut a piece of white card to 29.5 x 12.5cm, score at 12.3 & 12.5cm then 25 & 25.2cm to create deeper folds. 2. With the smaller panel of the right, fold up the card and glue a length of ribbon to the centre left of the larger panel and centre left of the smaller panel, these will tie once the other papers have been added. 3. For the decorative panels, cut the 3 larger sections to 12 x 12.5cm for the kraft card and the grey card will be 11.5 x 12cm , glue 2 inside the card and one for the front panel. Also add a piece of kraft card cut to 9.5 x 9.5cm layered with the rose card cut to 9 x 9 cm on the front of the card. 4. For the smaller decorative panels, cut the 2 pieces of kraft card to 3.5 x 12.5cm and the grey card will be 12 x 3cm, glue to either side of the small panels. Also add a piece of kraft card cut to 11.5 x 2.5cm layered with the rose card cut to 2 x 11 cm on the front of the card. 5. Finish with a cute resin flower in the top left corner. These stunning handmade wedding bouquets offer a bespoke look for your wedding and can easily be made in advance. We used this great video here to make our flowers. Come back tomorrow to see our Bright Retro themed wedding!